Picking apart technical lines after the sun's set is an activity with zero margin for error. 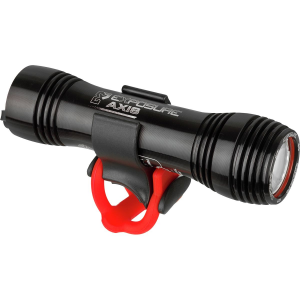 So, give yourself your best chance at success with the Exposure Axis Mk5 Headlight. This exceptionally powerful head light floods the trail with 1,150 lumens of brilliant light to see every detail ahead of you, while also offering multiple modes that adjust to the varying conditions with just a quick touch of the light via TAP technology (Touch-Activated Power). A built-in Fuel Gauge battery indicator shows you just how much power you have left before you need to recharge, while the included Micro-USB cable helps you plug in and juice up without spending money on any disposable batteries.